This must-read Alien in My Pocket book is the fourth in the series by Nate Ball, the host of PBS’s Design Squad and Design Squad Nation. 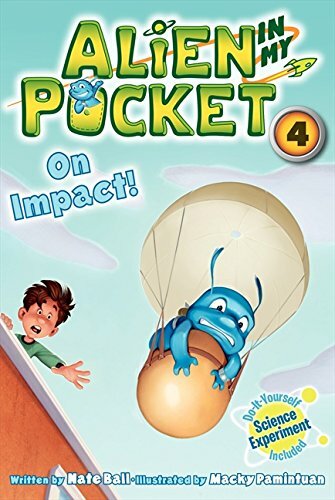 In this hilarious new adventure, Zack and his alien friend, Amp, learn about friction, deceleration, and how to soften a crash-landing. When Zack McGee crashes his bike, he’s stuck at home with his arm in a sling and his baseball season on the line. What’s worse, his bike crashed because his four-inch-tall houseguest, Amp, experimented on the brakes! Now Zack is easy prey for his little brother, Taylor, who’s determined to find out once and for all what mysteries Zack has hidden in his pocket.